It was a wonderful surprise to open the Sunday paper and see on the cover of the Parade supplement the faces of two of the greatest female tennis players who have ever lived: Chris Evert and Martina Navratilova. These two warriors played each other at the US Open, which began today, a total of four times with their 1981 semifinal and 1984 final considered two if the finest in a rivalry that stretched from 1973 to 1988 during which they played each other 80 times! Martina may have won three of their four matches at the US Open over the years, but the tournament belonged to Chris who won in 1975, 1976, 1977, 1978, 1980 and 1982 – more than any other player in the modern era. Martina was a four-time champion winning in 1983, 1984, 1986 and 1987. 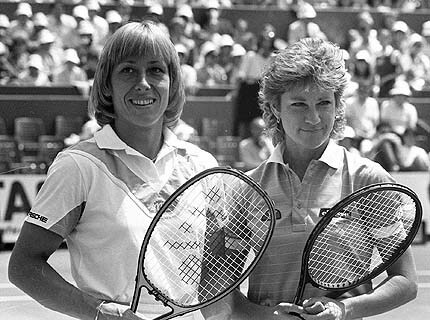 What has been all the more inspiring is that for more than 35 years, these two sports icons have had one of the most extraordinary straight-gay friendships that has endured wins and losses, divorce (three for Evert), high-profile splits (even more for Martina) and Navratilova’s recent bout with breast cancer. Martina has been courageously out for most of her career not waiting until retirement to say, ‘Hey, I’m gay.” And when she and Billie Jean King came out, Evert – America’s sweetheart tennis star – solidly supported each of them. That’s what is needed in all sports: for the straight stars to support the gay ones when they come out. Evert very publicly did and that was back in the early 80s. What makes this friendship unique? Chris Evert We’ve been through so much history, so many layers of emotions. We were such opposites, it enabled us to get closer. She has my back; I have hers. I think people forget that we were left alone in the locker room every Sunday after we played final matches, and one of us would be crying and the other would be comforting—nobody saw that. Martina Navratilova You always had to guard yourself because you didn’t want to be too destroyed when you lost or too gloating when you won, because you didn’t want to upset the other person. Now we don’t have to guard anything. Martina, Chris has said you’re a softie and called you a kitten. So what’s Chris? Martina She’s a cougar. Not in the way they talk about it now, but in that she’s very protective of her friends and family. It’s funny—she’s opened up, and I’m not nearly as open as I once was about my life. Chris I let it all out now. Chris, you’ve said that you couldn’t believe it when Martina would cry on the court, but were you also a little envious? Chris Part of me admired that she could just let it out for the whole world to see. The closest I came was at the ’85 French Open. I was so happy, and I was thinking, “How come the tears aren’t coming?” But I was so conditioned, they just wouldn’t. Martina I always admired Chris’s ability to control herself. Because I couldn’t. You two have what is arguably the greatest rivalry in sports history. You faced each other 80 times. What were you thinking when you looked across the net? What is it that you both have that champions need? Chris The mental part of my game. A lot of players were faster and stronger, but I think being able to just zero in and focus was my strength. Martina I think the ability to fail. Not being afraid to put it all on the line and come up short. Most people don’t have that. Chris That was when I lost 13 times in a row over a two-and-a-half-year period—when Martina was invincible. She lost six matches in three years. Martina Again, I think that speaks for Chris. A lot of people would have quit, but then she goes and wins the French Open twice. They write her off, and she comes back and wins a couple of majors. So you always wanted to beat her at her best? Martina That’s what it’s about. I’ve always said that, and people don’t believe me. Chris And God love her. Here’s an example: When my first marriage was ending, I was kind of down, and Martina said, “Come on up to Aspen” and taught me how to ski. We would ski from 9 to 2, play tennis for two hours, then be in the gym for two hours—and she showed me what she was doing with weights. We did this for a week. Not many people who are No. 1 and No. 2 competitors would do that. Retiring as a pro athlete is said to be a hard thing. Did you two commiserate? Chris I went from retiring to getting married and having three kids, so I went from one high to another high. Now it’s hitting me. We’ve both been to therapy, because you have the highs and the lows, but life is really in between, and it’s about trying to find that balance to live in the middle. That’s why I think we’re going to have a lot to talk about over the next 20 years.